Tonight the nephew and uncle team continued work in Muay Thai and MMA top position ground-fighting. 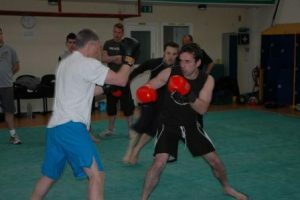 The former addressed improving combination work, introduced the spinning elbow and back kick, whereas the latter worked on developing positions and striking set-ups for submissions. The junior lesson began with a walk through of punch-kick combinations and clinch-work. Then we moved onto kick-catching and counters. This led us onto the spinning elbow set-up. We used this off a jab, off a scooping parry to a teep and after catching a round kick. This motion was then used to teach the back-kick. As with last Tuesday’s class we learnt it both offensively and defensively. We also incorporated a long range drawing technique, evading a low round kick and countering with the back kick. The senior lesson began with transitioning through postures. This is our standard pinning drill, covering side control, scarf-hold, north south, knee pin, reverse scarf-hold and mount positions. Here we really tightened up on positional control and ensuring that transitioning was strong, maintaining pressure throughout the movement. Next we looked at keeping control of limbs and the head, setting up for submissions. We moved through the transitions, executing at least one submission for each pin. Then we moved through the positions with striking combinations. Finally all of this was put together.